Keep your Trailer where you left it! 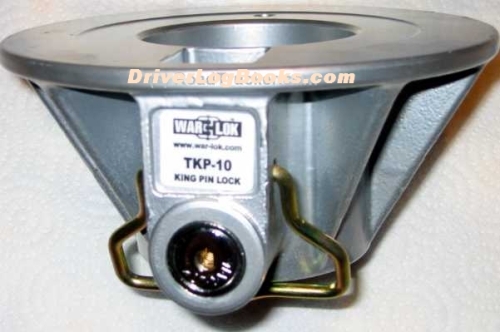 Designed for dropped trailers, War-Lok Truck King Pin Lock TKP-10 is a highly effective King Pin Lock. Considerably the best and most effective protection from cargo thieves, it is designed by experts in the industry. Cargo theft is a common problem in trucking and fleet operations. With this quality king pin lock at a discounted price of $74.48 for every trucker, we make sure your cargo is well-protected and safe from thieves. It is a $98 lock, but we cut the price just so we could save you from losses as we could. We give 24% off to every Trucker even if you buy only 1. That's $74.48 instead of $98.00. The conical shaped lock is lighter then most high-end king pin locks and wide enough to deflect the fifth wheel plate of a would-be thief's tractor. The TKP-10 King Pin Lock comes standard in powder silver color.